Meow! Welcome to my bed breakfast online blog. 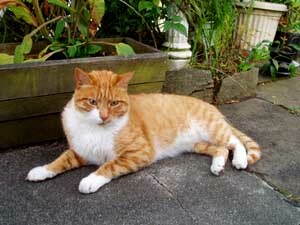 My name is Solstice the Cat, and I live at Hulmes Court bed and breakfast in Dunedin, New Zealand. This is my house and my owner, Norman. I am going to start blogging about my daily life as the resident cat at Hulmes Court bed and breakfast. I will tell you about all the exciting new things going on here at this accommodation, and in Dunedin. Dunedin is a great place to visit. The guests at Hulmes Court bed and breakfast usually stay for a few nights because there is so much to do here! I will tell you all about the different things that our guests like to do in Dunedin in my bed breakfast online blog. My blog is also a good place to start if you are looking for information about what Hulmes Court bed and breakfast is like, and what makes Norman’s bed and breakfast such a popular choice for accommodation in Dunedin. Oh, I should probably mention Jimmy before I go. Jimmy is my best friend and he lives at Hulmes Court too. This is him laying in the garden. Sometimes we get into fights, but they are only play-fights! Norman calls our little tussles the “morning rumble” because we usually fight in the mornings. It is my little trick to get more attention when all the guests are up having breakfast! Jimmy said he would help me out with the blog when he is not busy exploring the garden. So, watch this space for exciting bed breakfast online news! Well done, Solstice. You rock!